I was so excited to work with Lizzie, one of my friends from college! For their November wedding, she chose Asiatic and calla lilies, as well as Chinese lanterns (Physalis) for an added seasonal touch. Lizzie chose a cascade shape for her bouquet, in a medium size to complement her tea-length dress. Her flowers were a vibrant mix of orange calla lilies, purple Asiatic lilies, and red-orange Physalis, but a more muted olive green for the stems and foliage balanced the bright colors and helped to make the palette feel more autumnal. I brushed all the leaves with bronze paint to give them some extra shine and dimension. The stems were wrapped in ivory tulle and champagne satin ribbon, tied in a bow. The groom's boutonniere features a calla lily and two Physalis, along with purple hydrangea. Along with the champagne ribbon, all of the colors match Lizzie's bouquet. 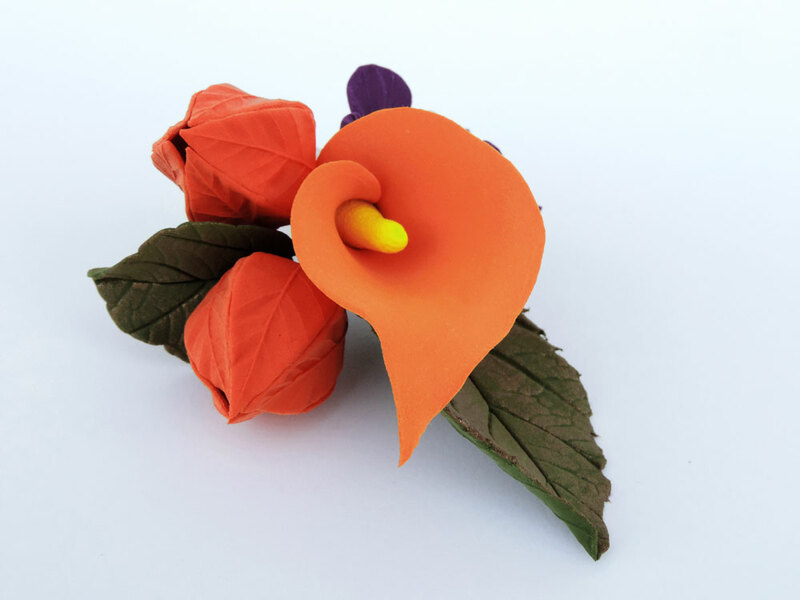 Lizzie's bridesmaids carried lanterns down the aisle instead of flowers, so she opted to have them wear hair clips featuring the same orange callas as in her own bouquet. I added in small berries and hydrangea in the other colors to help tie things together, and arranged the flowers differently in each so they'd be unique. The groomsmen's boutonnieres are a simpler version of the groom's: calla and hydrangea, wrapped in champagne ribbon. Matching corsage & boutonniere for each set of parents. Lizzie's mother wasn't as fond of orange, so I made the set for her parents in two shades of purple.